Winters is a time for indulgence in food ! The abundance of fresh vegetables in the market has always tempted each one of us to cook different forms of cuisines. 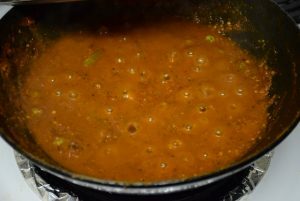 Today I am sharing with you my recent discovery of a Kolhapuri dish. Thanks to my Kolhapuri friends who always motivate me and appreciate my efforts. I hope this dish would incite new ideas in your mind and you would try it out your way too . 1. We start with preparing the masala for this dish. You may use the store bought kolhapuri veg masala too. But the home-made tastes better anytime. For this we dry roast all the spices in a wok(kadhai). 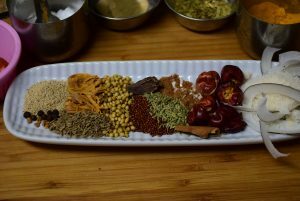 Add khuskhus, til (white) or sesame seeds , laung, kali mirch, javitri, dalchini, methi dana in a kadhai at medium or low heat. 2. 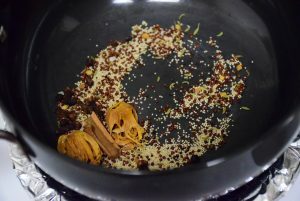 When the above spices started changing color and turn aromatic, add the whole dry red peppers, coriander seeds ,fennel seeds and stir them well and roast again on medium heat. 3. Roast them on medium to low heat until they change color and then allow them to cool to room temperature. Grind it to a powder form using a dry grinder or mixer. Kolhapuri dry spice is ready to use now. 4. Now boil at least 4 cups of water in a pan or a wok(kadhai). Add salt to it and bring it to a rolling boil. 6. Once they are par-boiled i.e. soft to touch but not mushy( cut with slight pressure with spoon) turn off the heat and strain them through a colander and wash them under cold tap water. This stops them from getting overcooked . 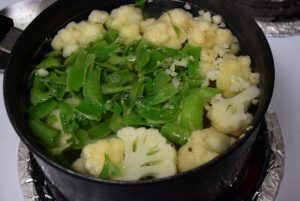 This is called blanching vegetables. 7. 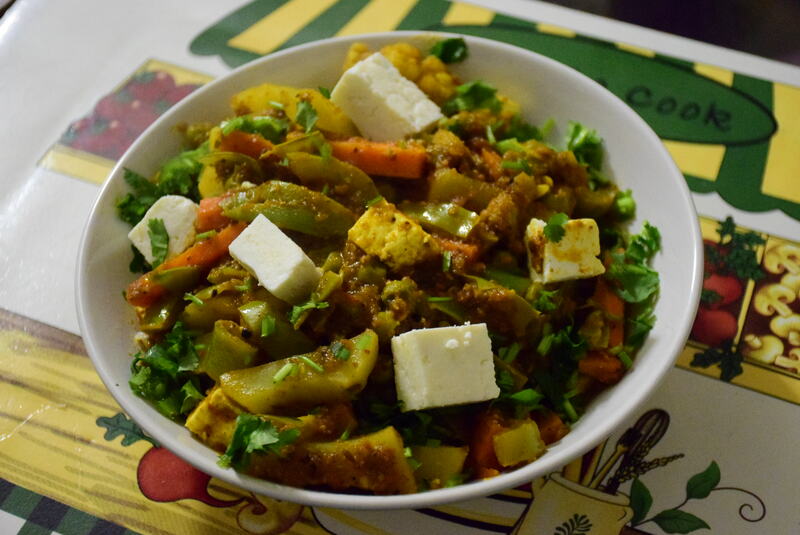 Slice the paneer cubes in equal size. Cut long thin strips of green bell peppers. 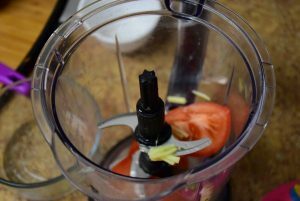 Make tomato and ginger puree by blending 4 large tomatoes and an inch-size ginger together. 8. Heat oil in a wok(kadhai). 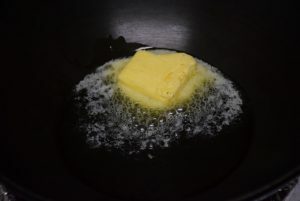 Add butter and allow it to melt. 9. Next add jeera, hing and bayleaf. Stir them well for a minute. 10. Add the peas, capsicums now. Continue stirring on medium heat. 11. 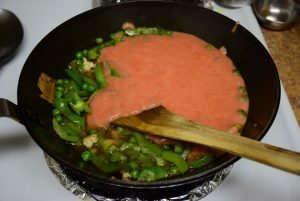 After about 3 to 4 mins , when the vegetables are cooked, add the tomato paste or puree made . Stir it until well combined and cover the wok partially . 12. Add salt, turmeric and red chilli powder . Stir it and allow it to simmer till the oil starts separating. 13. When 90% water has evaporated , add the kolhapuri masala. Give it a good stir. If you need to cover , cover only partially for quick evaporation of water. 14. 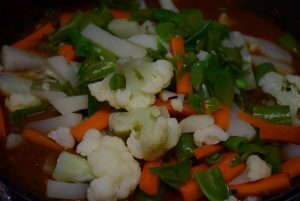 Also add the parboiled veggies and mix them well in the gravy. 15. 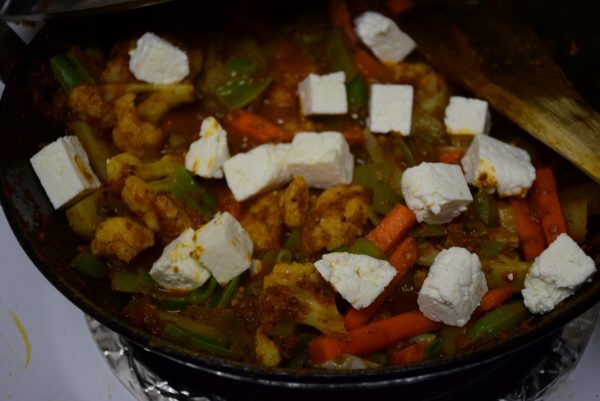 Lastly add the paneer cubes and toss them gently with the other veggies so that they get coated in all spices. I added some later for garnishing . Cover and let it cook in the steam on low heat for 2 to 3 mins. 16. In the end garnish with fresh cilantro and serve hot. Adjust the spice level according to your family’s taste. This dish is although on the spicier side. So if you want to enjoy a hot and fiery main course on a cold blue day, this is the perfect fit. I have made it without onions and garlic. But you may go ahead and add some to suit your palette. Winters is a time for indulgence in food ! The abundance of fresh vegetables in the market has always tempted each one of us to cook different forms of cuisines. Today I am sharing with you my recent discovery of a Kolhapuri dish. Thanks to my Kolhapuri friends who always motivate me and appreciate my efforts. This Kolhapuri mix veg is a different form of mix veg than the one we usually make in north India. It has strong west flavors of Javitri, Jaiphal, coconut, til , poppy seeds etc. I had made some paneer with fresh home-made curd /dahi. 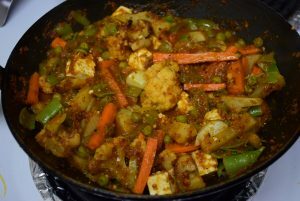 So made this Kolhapuri paneer mix veg in dinner. Now I have learnt a different form of serving paneer in my family to the "Paneer Patrons ." 😀 I hope this dish would incite new ideas in your mind and you would try it out your way too . 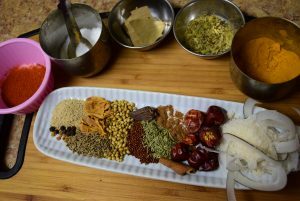 We start with preparing the masala for this dish. You may use the store bought kolhapuri veg masala too. But the home-made tastes better anytime. For this we dry roast all the spices in a wok(kadhai). Add khuskhus, til (white) or sesame seeds , laung, kali mirch, javitri, dalchini, methi dana in a kadhai at medium or low heat. 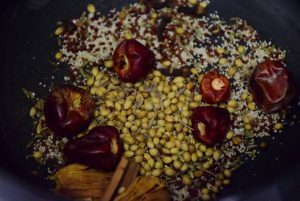 When the above spices started changing color and turn aromatic, add the whole dry red peppers, coriander seeds ,fennel seeds and stir them well and roast again on medium heat. Roast them on medium to low heat until they change color and then allow them to cool to room temperature. 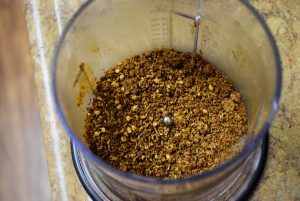 Grind it to a powder form using a dry grinder or mixer. Kolhapuri dry spice is ready to use now. 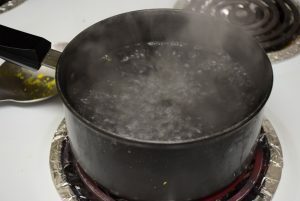 Now boil at least 4 cups of water in a pan or a wok(kadhai). Add salt to it and bring it to a rolling boil. Once they are par-boiled i.e. soft to touch but not mushy( cut with slight pressure with spoon) turn off the heat and strain them through a colander and wash them under cold tap water. This stops them from getting overcooked . 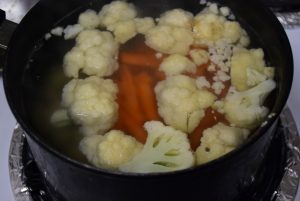 This is called blanching vegetables. 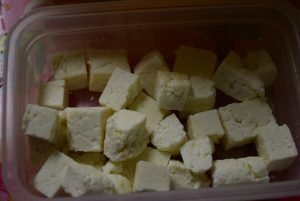 Slice the paneer cubes in equal size. 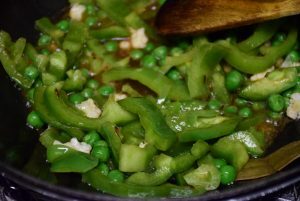 Cut long thin strips of green bell peppers. 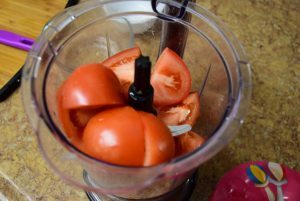 Make tomato and ginger puree by blending 4 large tomatoes and an inch-size ginger together. 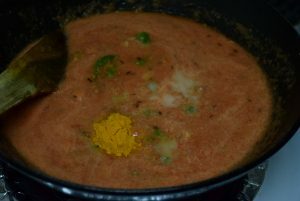 Heat oil in a wok(kadhai). Add butter an allow it to melt. Next add jeera, hing and bayleaf. Stir them well for a minute. 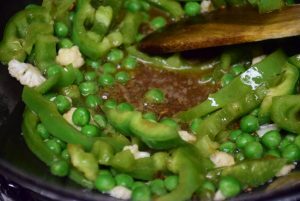 Add the peas, capsicums now. Continue stirring on medium heat. 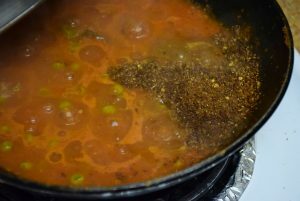 After about 3 to 4 mins , when the vegetables are cooked, add the tomato paste or puree made . Stir it until well combined and cover the wok partially . Add salt, turmeric and red chilli powder . 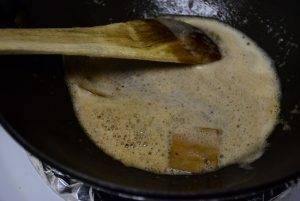 Stir it and allow it to simmer till the oil starts separating. When 90% water has evaporated , add the kolhapuri masala. Give it a good stir. 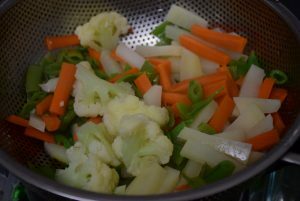 Also add the parboiled veggies and mix them well in the gravy. 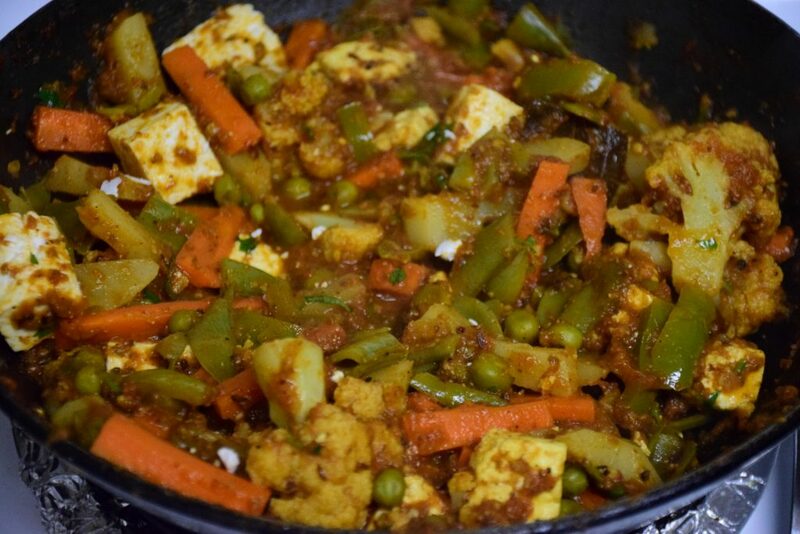 Lastly add the paneer cubes and toss them gently with the other veggies so that they get coated in all spices. I added some later for garnishing . Cover and let it cook in the steam on low heat for 2 to 3 mins. In the end garnish with fresh cilantro and serve hot. This entry was posted in Food, Main Course, Recipes and tagged adrak, aloo, anise star, batata, batons, bay leaves, capsicum, cauliflower, Cinnamon stick, Cloves, coconut dessicated, dagad phool, dalchini, deggi mirch, dry coconut powder, foolgobhi, gajar, ginger, gobhi, green beans, green chillies, hing, home-made paneer, Indian, jaiphal, javitri, juliennes, kali mirch, Kolhapur, Kolhapuri Mix Veg, lavang, lip-smakcing, mace, Maharashtrian, matar, matar chhilka, no onion no garlic recipe, paneer from dahi, paneer made from curd, paneer made from yogurt, peas, peas chhilka, peppercorns, potatoes, rocking dish, served with phulka, shimla mirch, Snap peas, spicy, tej patta, tomatoes puree, vatana, vatanyache chhillak, WInter's Delight, with parantha, with roti, without onion garlic.